This just in: London experiences a whole day of summer over the weekend! A whole day! I will freely admit that I was almost hyperventilating with excitement when the sun broke through the clouds yesterday and within minutes I was out there in the garden in the company of my bikini and a book. There’s a lot you can learn from idling away your morning in a sunny garden. You can hear what your neighbours are planning to make for lunch. You can see which tomato plant has the most tomatoes on it. You can watch how the bumblebees rummage around the butternut flowers until they are completely fuzzy with neon yellow pollen, and then fly drunkenly off. You can see where in the shrubbery the neighbour’s cat has made himself a little shady hidey-hole where he lies, invisible to the world but able to watch everything. You can also see the first red leaves on our tree. Clearly, it’s not fooled by this too-little-too-late attempt by the weather to make us think we are actually having a summer this year. It knows that this sunny day is but a blip on the weather’s generally downward trajectory, and that we’d better make hay while the sun shines. True to form, today has been grey and drizzly all day. Not cold, but certainly no bikinis. In fact, today is far more of a soup kinda day which suits me because (as I mentioned in a previous post) soup on a Sunday night is a tradition in our house, and it’s that easier to keep up the tradition if the weather is cooler! So today I’ve been pottering around the house (while Nick went to watch the cricket) and boiling up a pot of chicken stock in preparation for dinner. Sunday night is also the night I call my dad, and every week we enquire as to what is on the dinner menu. It’s become something of a standing joke because we always (or 99% of the time) know that the other one will say – soup! Despite living thousands of miles apart, both of us still stick to the tradition that my mom initiated decades ago, and it’s comforting in its small way. Of course, while I’m boiling a chicken carcass to make homemade stock, he’s popping a Woolworths (read Marks & Spencer) soup in the microwave. But for a man in his mid 80’s, who didn’t really do the grocery shopping or cooking in the 35 years he was married to my mom, I’d say even that is fairly enterprising 🙂 You go, dad! I, on the other hand, have a fridge full of British runner beans, so I thought soup might be a good way to use up a few. I like the fact that the soup has more texture than most, even after using the blender, presumably because of the inherent stringiness of the beans. I like mine really peppery, but I think a touch of nutmeg might also work well with this. Slice the runner beans into thin slices. You can remove any stringy bits, but I didn’t bother – rustic is good! Chop the onion and carrot. 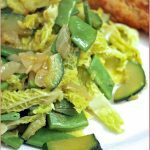 Heat the butter in a large saucepan and gently fry the beans, onion and carrot until the vegetables are beginning to soften and the carrot is translucent but not browned. Add the stock, bring to the boil and then simmer covered for about 30 minutes, until the vegetables are soft. Puree in a blender (or use your wand blender like I did). Season to taste with salt and pepper and serve with a hunk of crusty bread. We are having a very cold and cloudy Spring Day,but des[ite the cold weather I had to go to town this morning to get my annual bouquet of poppies to Celebrate the arrival of Spring. So although there is no evidence of Spring outside I have it in a vase on my coffee table. 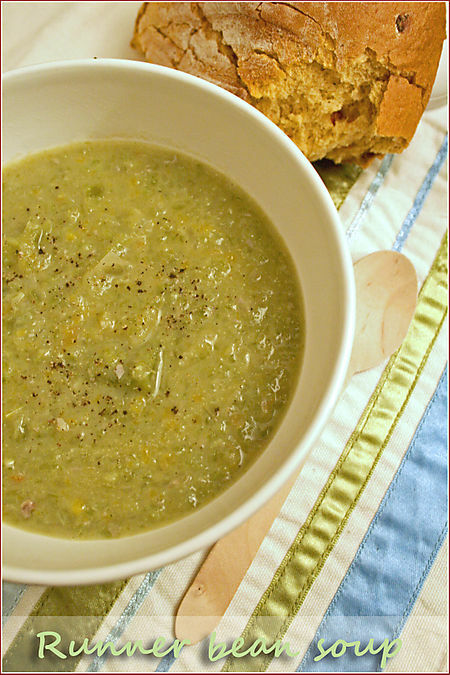 The soup looks delicious not to mention that rustic bread on the side….. I have never heard of runner bean soup (or is it just that I don’t get out much) LOL Anyway, it looks yummy! CS says I need to make more soups . So you are inspiring me. I love runner beans but have never thought about making a soup from them – what a great idea. It looks and sounds wonderful. I love your Sunday night ritual – in my family, we almost always have eggs on Sunday night. Either scrambled, boiled or in omelette form. That soup sounds simple and looks good! I can’t wait to try this one. YUM! Nina – so envious that you are awaiting Spring – we are moving into winter despite having skipped summer this year!! It’s been the wettest August wince 1912 (or was that 1812?? ), and they are predicting rain for most of September 🙁 Still, lots of opportunity to make soup! Sunday Night Soup, what a grand tradition. My family’s was Sunday Night Waffles, with ice cream, though luckily not every week. But soup, now soup that could be weekly, easily! I sat outside yesterday and enjoyed a few hours of winter sun – although I was fully dressed! Can’t wait for summer when I can see how much my bikini has shrunk this year! I was given 1kg of runner beans between 2 of us and had no idea what to do with it all. Not wanting to waste fresh homegrown vegetables I found this soup recipe and its delicious, although I have also added some Elmlea single cream. Tried the runner bean soup and its lovely. I always grow too many beans and this is a nice way to use them. 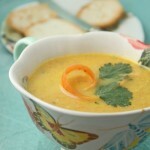 I have put loads in the freezer and will look forward to some nice warming soups in the winter months. Have you tried adding a boiled potato, its worth it. Thanks for this! I had a surplus of runner beans in the fridge and just googled “runner bean soup” not expecting to find anything. I did, and was delighted with the soup – delicious, so thank you! I too added a couple of small new potatos to thicken it slightly. I wish people wouldn’t write in and say “can’t wait to try this” – I’m much more interested in reviews of what it tastes like, not of people who haven’t tried it. Anyway, I did try it, and it was excellent – thank you – and that’s what people need to see posted! Thanks. Got a glut of runner beans and just typed in runner bean soup – am now off to do some picking!! hope it’ll be ready for lunch. This soup looks delicious, fancy entering it into our soup of the month competition – we’re looking for the very best vegetarian soup we can find! 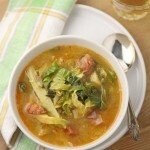 Hi there, I’m going to attempt to make this runner bean soup today, but I was wondering if it can be frozen once made? Hi Marie – yes, you can freeze it – I have done so in the past with no problems.